They said it would happen but I didn’t believe them. Back when I was just visiting Paris, I’d heard some expat friends tossing random French words into their English conversation and I would think, Ew, how freaking pretentious are you? Were they trying to convince me how assimilated they’d become? Oo, look at me! I live in France now! Oh, please—s’il te plaît. I mean, it’s not like you can actually forget the word in English. Um, turns out that—bah ouais!—you can forget the English word after a few years of speaking French all day. And certain frequently used French expressions and pronunciations begin to take over your daily speech, regardless of the language you’re speaking. Insidious little buggers. Excuse me? My foster bird used to like to sit on my head. Things that make you go, “Ouf!”: a hot guy, or climbing these stairs with heavy grocery bags. [oof] Approximate meaning: Phew! Whew! Wow! Man! > I’m not sure when this word entered my English speech, exactly, but it’s like I was born saying it. Just the other day, for example, I had hauled a load of groceries several blocks, then up two flights of stairs. “Ouf!” I said, as I finally unloaded the heavy bags in front of my apartment door. And the kicker? There wasn’t even anyone around to hear it, so you can’t say I was showing off. Some French expressions with “ouf!” according to wordreference.com? De ouf = wow factor; sans avoir eu le temps de dire ouf = before he knew what hit him. When your neighbor’s leak does this to your wall. Yup, there’s a word for that. [sort of: pu-teh] Literal meaning: whore; pejorative: sh*t, f*ck (You get the picture.) > Evidently, I curse like a truck driver because this word stuck pretty much right away. I no longer say any of the English-language equivalents. Maybe in my head I think I’m not really being foul-mouthed because it’s in French. French is classy, mais non? I extol the wonders of French swear words in my memoir My (Part-Time) Paris Life, Chapter 12: “Living the Dream?” where I talk about my neighbor’s leak trashing my apartment. That merited a lot of French swear words. [boo-lanzh-uh-ree] Meaning: Bakery > Okay, this one’s not my fault. With the exception of Le Pain Quotidien, there is nowhere in my New York neighborhood where you can buy your daily bread outside of the grocery store (and Amy’s). I never say the word, “bakery” anymore because my last good ol’ fashion bakery on lower 6th Avenue closed 15 years ago. Boulangerie is the only word I have to describe the place where you do that thing. So it’s “boulangerie” no matter where I am. Check out this episode from my series about my favorite boulanger in Paris, pictured here: Du Pains et des Idées. On my phone posting to social media. I have crappy réseau. [ray-zo] Meaning: Network, but it can also be used for cellphone reception as in “J’ai pas un bon réseau“—I don’t have a good network (reception) > This word latched onto me the first time I heard it. Why, I cannot say. But now it’s in my head, and I honestly cannot remember the expression in English most times. I have to poll every expat in the room: “What’s it called?” “What do we say?” The first time this happened, I was mystified. How could I possibly forget a word I’d been using for…well…ever? I didn’t know whether to be excited that French was grabbing hold of my brain, or concerned about early onset dementia. I’m still not sure. [kay] Meaning: A structure built parallel to the bank of a waterway; quay. In France, also a train platform > “Meet me on the quai at the Oberkampf Métro station,” my American friend instructed me in a text. “WTF is the quai?” I texted back. My phone rang. “The quai!” she repeated, as if that would make it clearer. “Where you wait for the train!” Her voice was tinged with annoyance as if I was the one being obtuse. “You mean the plaaatformmm?” I replied, equally annoyed. “Who the hell says quai?” Well, I do, now. Every English speaking expat I know calls the platform the “quai” so I had to bend to the will of the masses. These days it takes an effort to say, “platform.” I know. A little part of the New Yorker in me just died. [cah-nah-pay] Meaning: Couch, sofa > In 2012, I bought my place in Paris and had a blast furnishing it on a dime. I quickly mastered the French words for all the various furnishings. I’ve forgotten most of them, now that the house is furnished—except (for some reason) the word for couch: canapé. I use it exclusively these days, erasing from my vocabulary any other word for this item. Maybe because it’s prettier than “couch,” the word I grew up using, or perhaps it’s because canapés make me think of finger sandwiches. And who doesn’t love high tea? Take a tour of my Paris apartment, here. Enviable rangement in my “dressing” chez moi. [ranzh-mahn] Meaning: Storage > “This apartment has amazing rangement!” I said to my American friend, while viewing an apartment near the Bastille she’d wanted to rent. She, a non-Francophone, looked puzzled at the word I’d just flung at her. I pondered a few seconds, poking around my brain for the word in English. “Stowage…stockage? No—storage!” This is what happens when you spend a year Paris apartment hunting online. The descriptive words used by Parisian real estate agencies—agences immobilières—to describe your prospective life-changing dream house become very precious to you, and therefore seared into your brain. No other words, besides French ones, can describe the fabulousness of a Paris apartment. “Storage” sounds like a place you cram full of old camping gear. “Rangement” speaks of limitless possibilities—the range of wonderfully organized and perfectly curated shoes you can put inside. The word for closet, by the way: le dressing. [vee-treen] Meaning: storefront window; glass display case > This is another one of those words like réseau and rangement where I really have trouble remembering the English equivalent now that I’ve embraced the French word. It’s just more efficient than “storefront window display,” so it wins out when I’m speaking off the cuff in my mother tongue. “Hey, did you see that blue dress in the vitrine at BHV?” Yup, I’m that person now. Here’s a fun one: the French phrase for window shopping is “faire du lèche-vitrine” or to do some window-licking. Yes, I said licking. The French are really passionate about their sales. Yum! 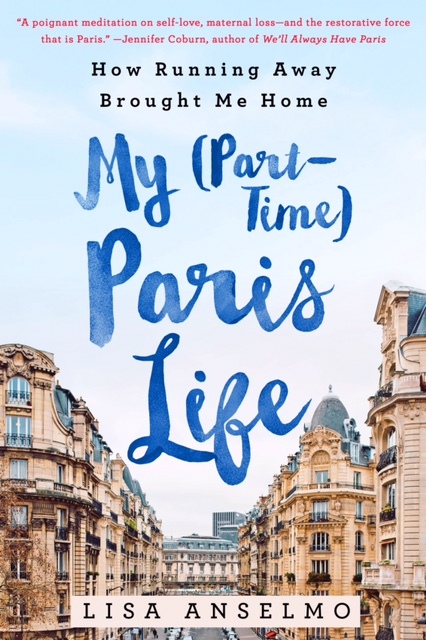 Learn more about the journey that led to My (Part-Time) Paris Life in my memoir of the same name, ON SALE NOW! Hilarious! I have a theory that for every ten or so French words I learn, I lose an English word. I only lived in Paris for a year, but I keep wondering if I, too, have early onset dementia! Mid-conversation, I find myself searching for the correct word in English! Such a big fan of you and your writing! And it is especially sweet to be reading this while lying in bed in Paris!! You inspired me to take my first solo trip in 2017, and this will be my third time here since. The city is intoxicating and inspiring and lovely. I so enjoy reading your pieces, thank you for sharing! Oh Amy! What a wonderful thing to read. I’m humbled to have been a source of inspiration. Enjoy Paris! Funny , but oh-so-true post on incorporating those French words. The familiarity just creeps in before you know it and I sometimes even try to use French words when doing WordBrain puzzles. The other amazing thing , and a delight when it happens, is dreaming in French. My word is Merci… So much sweeter than Thank You. Oh my gosh!! Loved this post.. The same for me!! I have a few more that I use, and I frankly don’t remember the English words for them anymore!!! I think the only one I don’t use is rangement, because we haven’t got any!! Hahaha! Hysterical. Most people don’t have much rangement! Your paragraph about ‘rangement’ made me feel SO much better, because I do the same thing, knowing EXACTLY what something means in the foreign language but being unable to come up with the English word for it. Today it was after hearing a Norwegian word and trying to come up with the English equivalent. “You know, what planes do. Like flying high over something without stopping, you know, for a long distance…” TO SOAR. Apparently my brain only functions in one language at a time. And a French ‘pardon’ sounds so much nicer than an English ‘excuse me’ or just plowing right through. I found myself saying ‘pardon’ after coming back from Paris and Belgium and then realizing people would look at me funny if I kept that up! Love it! Glad I’m not alone!